Audi has unveiled a concept supercar with a driver’s seat that slides to central position for track use - but also with a boot the size of an A4 saloon. The PB18 e-tron model is supposed to synthesize wild racing abilities with everyday use, hence a superfast 0-62mph speed of 2 seconds and a luggage capacity of 470 litres. This means the car has an aggressive sports front end, but a shooting-brake-style rear with a boot shape sometimes seen in saloons. The new concept was unveiled at Automotive Week in Monterey, California. The technical concept behind the PB18 e-tron was born using expertise gained during the Audi Le Mans racing programme, and the production was the responsibility of the experts at Audi Sport GmbH, the company’s high-performance subsidiary. 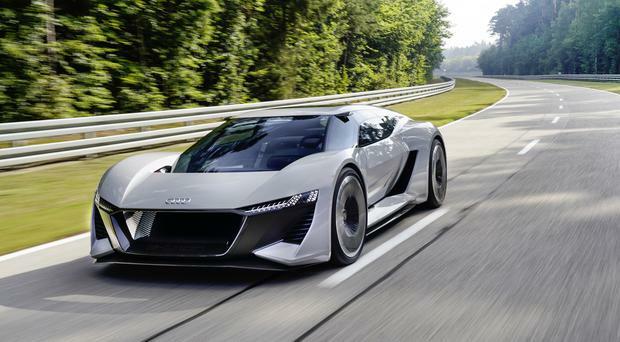 At first sight, the Audi PB18 e-tron is similar to with another spectacular concept car from the brand – the 2017 Audi Aicon. But while the Aicon was designed as a fully automated, long-distance luxury vehicle, the PB18 e-tron is designed to be a “radical driving machine” for the racetrack and road. Unlike the Aicon, the PB18 e-tron has had all luxuries stripped out to make it as lightweight and aggressive as possible - but still useable in the real world. In place of the Aicon’s premium features are a driver’s seat and cockpit that are integrated into an inner monocoque shell that is moveable sideways depending on how many occupants are on board. When driven solo, the monocoque can be positioned in the centre of the interior as in a “monoposto” – the perfect location for the racetrack. This is made possible not least by the by-wire design of the steering and pedals; a mechanical connection of the control elements is not needed. When the driver’s monocoque is moved into the side position, from where the PB18 e‑tron can be steered in everyday driving like a conventional road vehicle, there is room for a passenger seat, integrated low above the ground and equipped with a three-point seatbelt. Audi’s Gael Buzyn said: “We want to offer the driver an experience that is otherwise available only in a racing car like the Audi R18. That’s why we developed the interior around the ideal driver’s position in the centre. The concept uses three powerful electric motors – one up front and two in the rear. The latter are centrally located between the steering knuckles, each directly driving one wheel via half-shafts. They deliver up to 150 kW of power to the front axle and 350 kW to the rear – the Audi PB18 e-tron is a true quattro. Maximum output is 500 kW, but with boosting the driver can temporarily mobilise up to 570 kW. The combined torque of up to 830 Nm (612.2 lb-ft) allows acceleration from 0 to 62mph in just over 2 seconds.